On the last exam, I noticed that some folks had trouble going from information in your tool (organizational chart) to writing a paragraph using cues. I want to make sure that everyone understands this connection!! So let’s practice!!! Look at the chart below and read the written paragraph below it. Instructions follow. 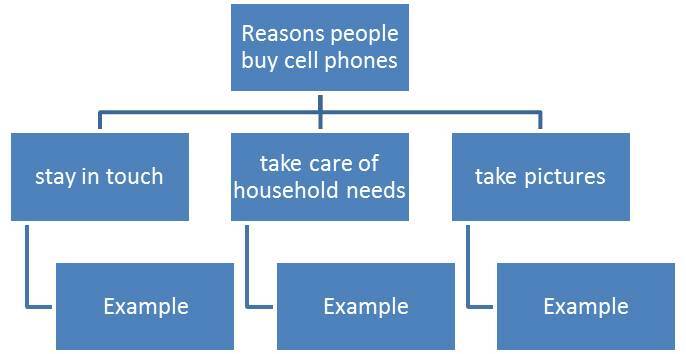 People buy cell phones for three main reasons. First, they want to stay in touch with family and friends. For example, they work all day but want to talk to their families. A cell phone allows them to call at lunch and during break. Second, people want to take care of household needs when away from home. For example, they may want to make a doctor’s appointment, or schedule a repairman. Finally, people buy cell phones to take pictures. It is very convenient to have all these tools on one device. 2) Put a double underline beneath each cue that you see. 2) Then write a paragraph using cues, complete sentences, and the correct verb tense. 1. The man is friendly. 2. The moon is full. 3. Joaquin has many classes this semester. 4. The woman walks to work every morning. 5. They watch football on Sundays. 6. He loves to play soccer. 7. Sara listens to music after school. 8. He comes from Puerto Rico. 9. The people bring good ideas to the meeting. 10. We always forget how to get to that store. 2) Identify the subjects and verbs – then write these in the correct order.